Epitaph, Labuan Memorial, Panel 18, Age 26. Selarang Camp Changi, Thomson Road (Caldecot Hill Estate Camp), River Valley Road Camp, Selarang Barracks Changi. Informal outdoor portrait of WX17363 Private (Pte) Claude Ocea Nash of Subiaco, WA. 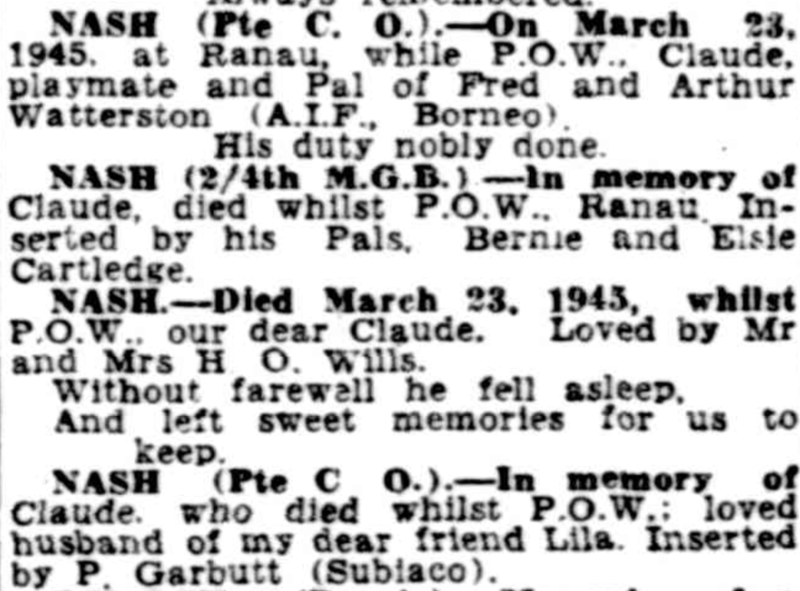 Enlisting in the Second AIF in October 1941, Pte Nash served with the 2/4 Machine Gun Battalion in the Pacific campaign and was captured by Japanese forces at Singapore in February 1942. 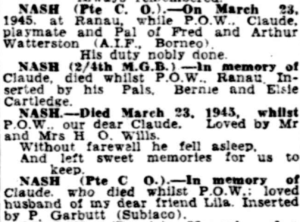 Spending most of his time as a prisoner of war (POW) at Changi camp, he died of illness in Borneo on 23 March 1945, aged 26. Pte Nash’s paybook photograph is held at P02468.773. Soldier was wounded in action on 9.2.1942 and admitted to 2/13th Australian Hospital with small fragments of shrapnel in the arm. Discharged to unit on 16.2.1942.